After a really good week where I saw one of my all time favourite bands, Teenage Bottlerocket, in Bristol, I was looking forward to fishing Todber for the first time but then came down with a stinking cold on Thursday and wasn’t sure I’d feel well enough to go. When the Tart text me to say he was fishing, a day in my sick bed started to look even more favourable! I woke up at the crack of dawn and felt half human at least, so decided a day in the fresh air might help!I met Scotty and a few others in the Little Chef at Podimore for breakfast, it was really busy and by the time we got served and had eaten we were quite pushed for time but got to the venue with a few minutes to spare. There were 37 booked in for this one which just shows what a popular venue it is, it was also great to see Alan Oram who I hadn’t seen since the Chard Pairs league, many moons ago, it wasn’t so nice to see the Tart who was looking very pleased with himself. It’s a great set up at Todber with loads of lakes where you can park behind your peg in most cases and there’s a well stocked tackle shop on site. The draw was announced and I delved into the bucket quite late, I opened my ticket to see 38 on Hill View staring back at me, this meant nothing to me, the Tart was on 49 on the same lake and when he showed Freddy Roberts and Ashley Tomkins there were some jealous looks and shouts of ‘That’s the best peg on the lake’. Hopeful of a similar reaction, I tentatively showed them my peg number only for the jealous looks to turn to pity and comments like ‘At least you should get a few bites’ didn’t fill me with much hope. 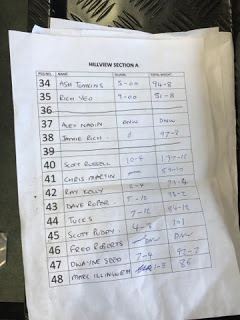 Scott said it wasn’t the best area and he’d drawn a couple of pegs away on number 40. 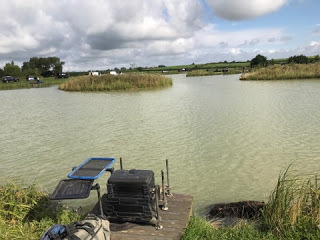 With it being my first visit I was going to keep it simple and several people had advised me to fish just down the slope at top two plus two and also feed a margin line for later. 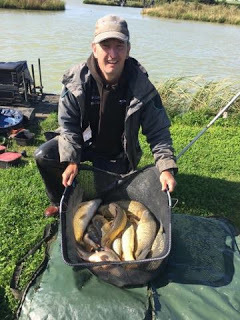 Looking at previous results, well over a ton is needed to frame and 40-50lb weights win the silvers, busy fishing with lots of bites from little tench, carp and skimmers along with the odd lump. The side tray was also fairly uncomplicated with three big tins of corn, Bait-Tech 6mm and 8mm Carp and Coarse pellets plus I mixed up some Special G Dark to which I added some Nutty Stick Mix liquid and added a generous helping of corn. I set up a Drennan 0.4 gram Carp 1 for fishing corn and pellets at top two plus two straight out and another rig featuring a hand made pattern for fishing the inside at the same distance but at an angle to my right. It was already quite windy and it was looking like we might get some of the wet stuff which was bad news for Alex Nadin on my left as he hadn’t got his waterproofs with him! On the whistle I fed three balls of groundbait packed with corn straight out and then fed some corn and 8mm’s by hand on the inside line. Both my neighbours started on the method feeder fished towards the islands. 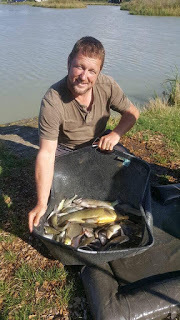 I had to wait a while before I had my first indication which resulted in a 4oz carp, I had another next chuck and then a couple of tiny tench before I caught a roach and then a small perch (on corn!). Then I hooked a fish that saw a fair bit of grey hydro exit the pole tip and I landed a 4lb carp, a smaller one followed and then a skimmer. Scott and Alex both had a couple of carp but it wasn’t fast and furious at this stage although I was expecting the sport to improve as the day progressed. The wind was getting steadily worse and it started to rain hard enough for me to put my coat on, after an hour I probably had 5lb or so which wasn’t great and if anything my bites were slowing up. I could see odd fish being caught but nobody looked to be bagging and Scott commented how hard it was fishing. 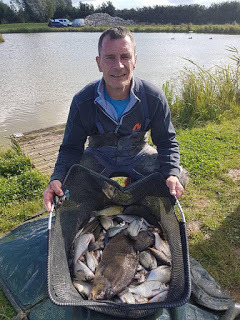 I had a few more fish in the second hour including a nice skimmer around a pound and a couple of half decent carp but going into the third hour I was really struggling and it wasn’t just me. I tried banded pellet but only had one bite which I missed and at the half way point, I probably had around 15lb. I could hear the anglers on the far bank talking and it sounded like it was a similar story over there with people admitting to 20-25lb, Freddy Roberts came for a walk and said he was struggling and was going to get something to eat. 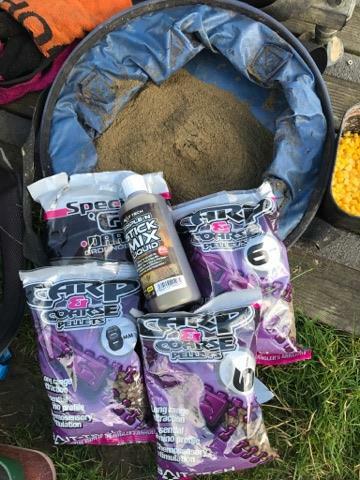 I’d been feeding corn and pellets on my other line and with three hours to go it was time to try it, I had to wait a while for my first bite and landed a nice mirror carp about 2lb, more followed including some good commons and a 3lb skimmer and all of a sudden I was starting to put a weight together. 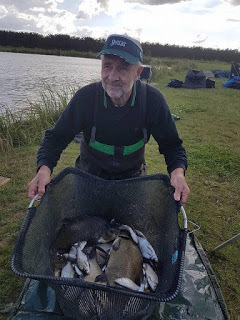 Scotty was getting odd fish and I could see Ash up on 34 netting fish regularly but I was doing okay and if anything my peg was getting stronger and stronger. 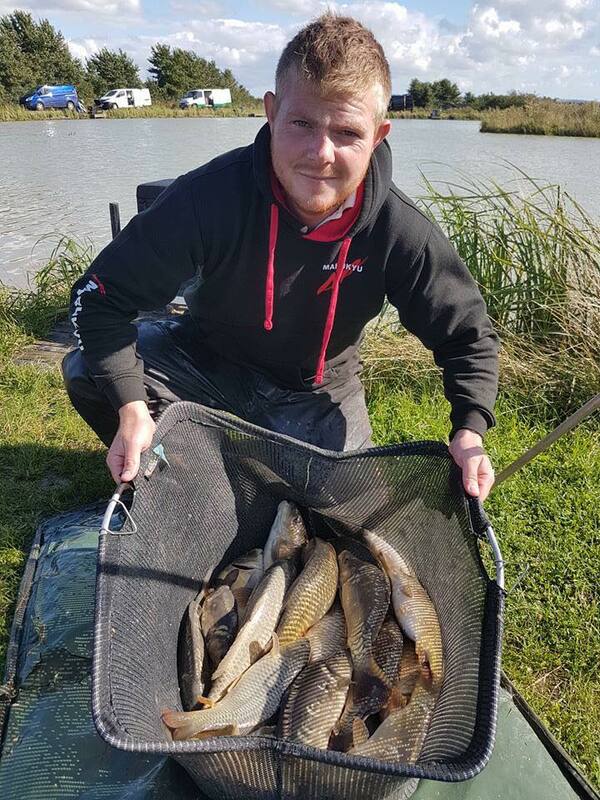 With an hour to go, Scott has come in the edge by the hay bales where he’d fed heavily with groundbait and maggots and started to get some proper beasts, including one that he could have put a saddle on! I was still catching well but after hardly losing a fish all day I lost three in quick succession, including one that felt like a big fish. 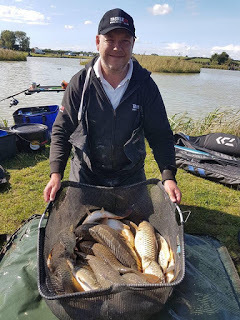 I then hooked one that just plodded around but I couldn’t get its head up, after what seemed like an age I managed to get a fish that looked to be around 10-12lb in the landing net, breaking it in the process, I had a spare so wasn’t out of action long. Scott wasn’t catching as quickly as me but every one he landed looked like a lump, just before the all out was called, my float buried and I hooked another only for it to come off and I didn’t have time to go back out again. 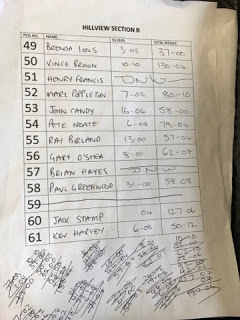 I ended up with 49 fish (37 carp plus tench, roach, skimmers and perch) and to be honest I didn’t have a clue what weight I had because my carp ranged in size from 4oz to 12lb! The venue’s team does all the weighing in and arrived just after I’d started packing up, Ash had weighed 94lb 8oz, Rich Yeo on the next peg had 51lb 8oz and Alex had already gone. My first carp net went just over 40lb and my second net was 51lb and I wasn’t sure I had enough in my silvers net to beat Ash but it was called at 6lb to give me a total of 97lb 8oz. 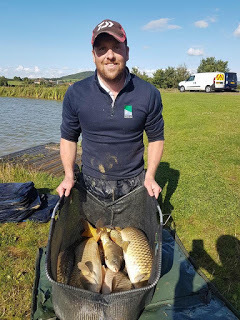 I was a little disappointed not to break triple figures but by the same token I’d had a cracking days fishing after a slow start. 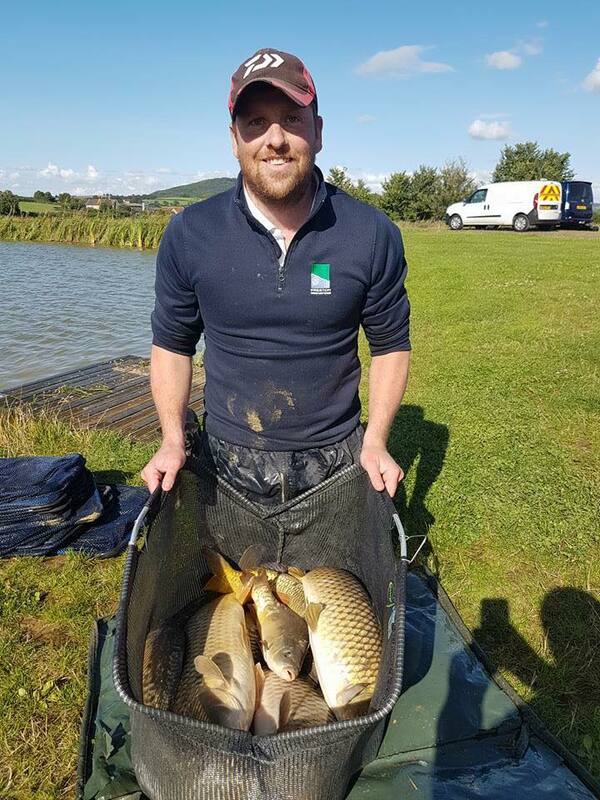 Scott weighed a fantastic 137lb 11oz with his biggest fish going over 18lb and the last hour had seen him bag right up. The Tart turned up looking rather dejected as he’d only weighed 37lb and Vince had given him a right spanking off the next peg when he weighed over 130lb, so another of his pounds was heading back to Chard with me. 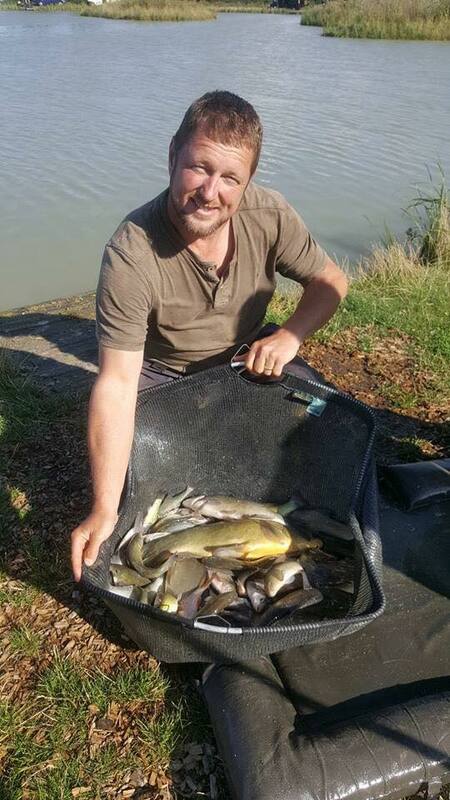 As I was packing up I could hear the odd weight being called out as the scales carried on round the lake and I started to think I had a chance of a pick up. 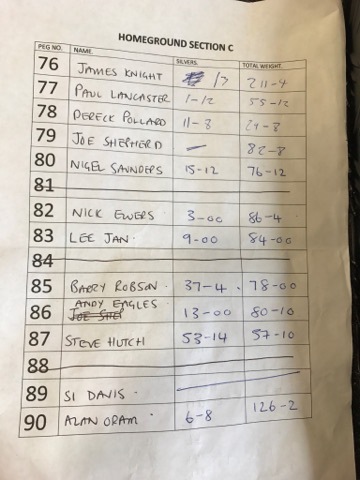 Back at the results and the top weight came from Homeground with James Knight weighing 211lb 4oz from peg 76, Scott was second and Vince Brown was third with 130lb 4oz. Top silvers also came from Homeground with Steve Hutch weighing a brilliant 53lb 14oz from peg 87. I just missed out on the section money as Scott Puddy won our section with 101lb from peg 45. Thanks to Todber Manor* and Scott Russell** for the photos. I really enjoyed the day and will definitely be back again, it’s just a shame it’s so far away, my main worry was getting battered but I didn’t disgrace myself and only just missed out on the ton (and a pick up) in the end. Previous: Previous post: A Long Time?